During “Operation Overload” executed on D-Day, it was imperative that the Allies secured all the paved roads off of the beaches so that waves of subsequent forces could unload and get moving into occupied France. In particular, there was a large, strategically important road which stretched south from the tiny coastal town of Colleville. 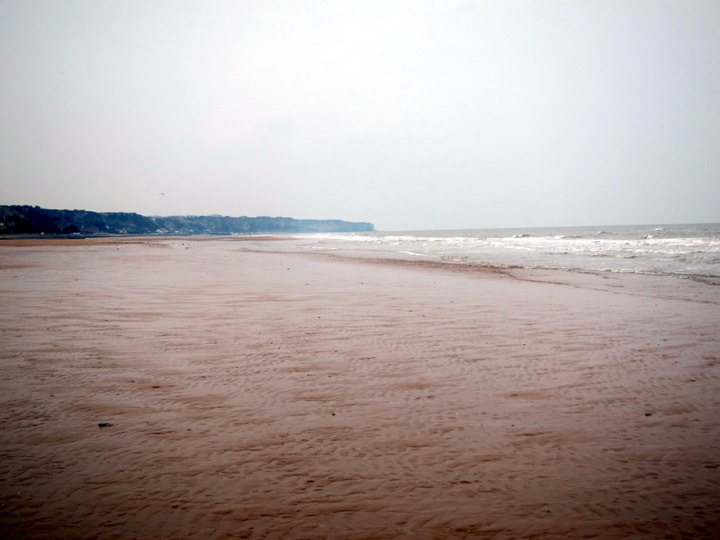 Located in the center of Omaha Beach, this became the American objective during the D-Day invasion. Unfortunately this extensive beach was heavily defended to the east and west by German guns protected in concrete bunkers. Ultimately, the Americans flanked and took these gun positions and met in the middle at the important road south. 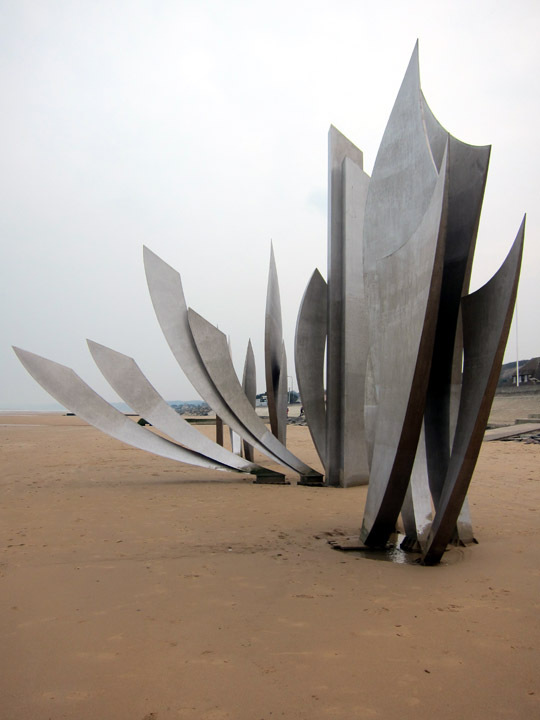 Today, just in front of this critical road and on the edge of the beach is a huge, metal memorial sculpture. It’s the kind of piece that requires some time to walk around and contemplate its different shapes. There are three clusters of metal wedges. With sharp points and thin edges, the elements cut through the beach like blades. 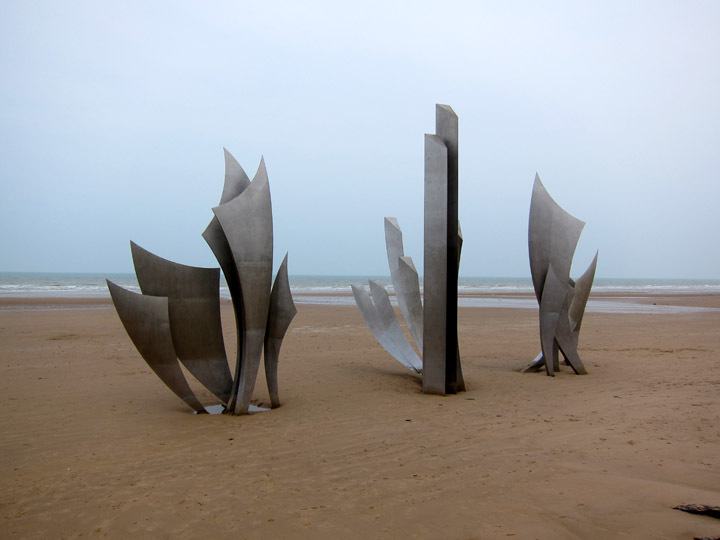 The beach memorial from the side. I think it looks like three frozen explosions throwing sand, gas, heat, and shrapnel into the air. The more I looked at the sculpture, the more I liked it. It is not overtly political; it is neither sad or celebratory. 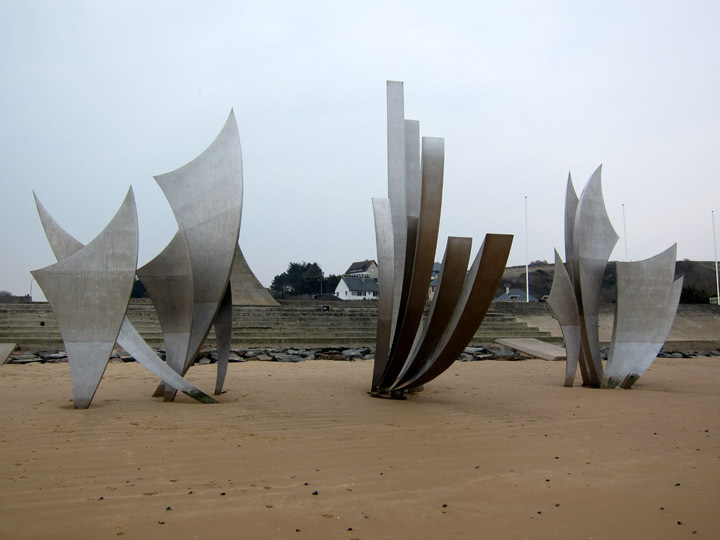 The memorial is a metal punctuation mark and an alert that this is not just a beach. Omaha Beach Memorial facing the road. 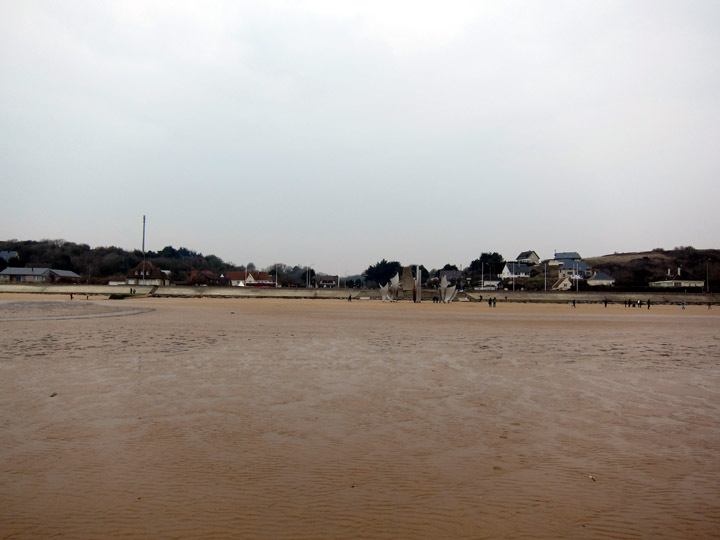 I wanted to get some perspective on the Allied landing on Omaha Beach so I wandered down to the water’s edge. As a good point of reference, it was hard to make out the details of the sculpture. I could tell the school teachers were yelling for their students but I couldn’t make out the words over the ocean winds. And this was a fairly calm (albeit cold) Spring day. 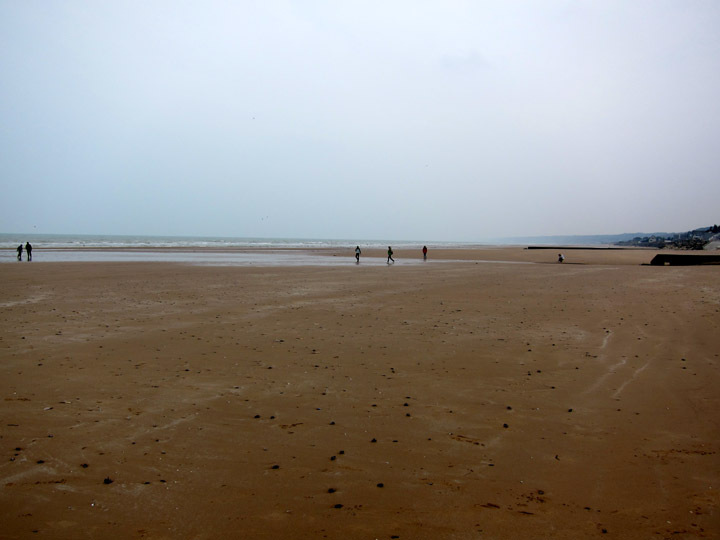 It was not quite low tide yet, but I could really see how expansive Omaha Beach was and how exposed soldiers would have been. Open beach stretched out to the East and West of me. There are several museums in Normandy that explain D-Day, so I didn’t expect to get a lot of informative signage at Omaha Beach. There was only one plaque near the memorial. It had an image of a fairly tired looking soldier standing on the beach once it had been secured. A very simple informational sign accompanies the memorial sculpture. This image seemed very fitting. 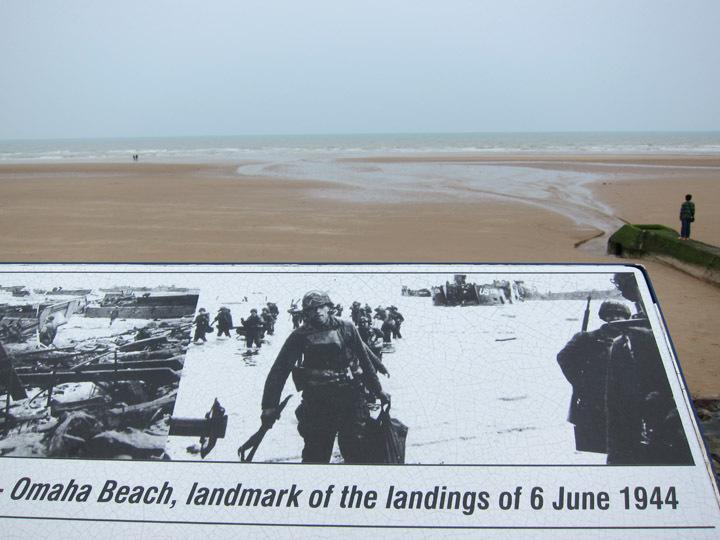 As calm and peaceful as the beach looks today, visitors need a direct photographic comparison to even begin to imagine what happened on Omaha Beach 70 years ago. The wild memorial with its piercing metal spires is also appropriate here too. It interrupts the rolling sand dunes and reminds visitors, with their ice cream and swimsuits, that 70 years ago this was a battlefield. See here for photos and a walk through the Normandy American Cemetery.